This chapter will provide a case study reflection on the outcomes and lessons of a long-term community-university partnership that originated among a group of students exploring the relationship between creativity, culture, and community development in Memphis. A collaboratively-developed “Memphis Music Magnet” plan is being implemented in the Soulsville USA neighborhood to explore the regenerative potential of culture-led planning. The plan seeks to create neighborhood-level change by supporting musicians, celebrating the artistic heritage of the neighborhood, and creating new types of interaction and collaboration. This reflection will consider the missed opportunities and often-indirect relationship between positive impacts and preconceived intent. On a December night in 2015 a crowd of about forty packed tightly into an upstairs art gallery space on College Street in the Soulsville USA neighborhood of South Memphis to engage in a dialogue about the Black Lives Matter movement. The group was like the city. Some came dressed in uniforms – school uniforms, the scrubs of a home health aide, a janitor’s jumper – and others in suits. An elderly neighbor who had walked over from her home around the corner found an empty chair next to a pair of students from Rhodes College, who drove together from across town. They had never been to this part of Memphis before. Others were back in their old neighborhood for the first time in years. They would never have expected this kind of space – new and sleek with modern touches, but designed to reflect like the past – to be here now after so many decades of neglect and disinvestment, and they were unsure whether to feel pride in where they came from or guilt for having left. The conversation was facilitated by a panel of thought leaders who could connect to the diverse audience from a variety of perspectives: a social justice advocate, and founder of a digital black business directory designed to direct African American buying power into black communities; a Soulsville USA resident and pastor of the neighborhood’s historic Baptist church; an outspoken sociology professor known for her provocative commentary on race, gender, and class in the south; and a local freelance photographer and artist. The night’s panel discussion served as the closing reception for artist Joey Miller’s “5 Fifths Memphis” photography exhibit, which had been on display in the gallery for a three-month period. Miller’s photos were a series of individual portraits, each staged in a similar manner. Each showed a black man or woman holding a placard reading “I AM A MAN” or “AIN’T I A WOMAN.” The subjects were posed stoically against the jarring backdrop of the decaying interior of the long-vacant and neglected Clayborn Temple in downtown Memphis, just two miles from the gallery space. The “I AM A MAN” signs were replicas of those used in the marches led by Dr. Martin Luther King, Jr. during the sanitation workers strike in Memphis in 1968, just before King’s assassination. The Clayborn Temple had served as a headquarters for the civil rights protesters – and the iconic placards were produced in the church’s print shop. Through the use of recognizable historical imagery and the metaphor of a Memphis architectural landmark, Miller provided a discomforting visual of the unsatisfied potential of the civil rights movement that had been so deeply rooted in Memphis and a bridge to the current-day strained race relations motivating the Black Live Matter movement. The Slim House opened in April of 2014 and is the result of redevelopment of the former home of legendary blues musician Memphis Slim. The property has been converted into a music-centered community space for artistic collaboration, music training and storytelling. The space includes video-casting rooms to record oral histories, and is anchored by a fully equipped recording studio run on a cooperative basis to support emerging artists, as well as apprentices learning the production business. Slim House members call it a “for us by us” resource where future generations of musicians can gather, rehearse, learn and create. The Slim House is the most visible outcome of a broader arts-based neighborhood revitalization plan called the Memphis Music Magnet, which was developed by a university-community partnership under the direction of the Department of City and Regional Planning at the University of Memphis. The planning process began in 2008 when faculty and students set out to determine whether they could develop a tangible, place-based approach that would explicitly and appropriately link creativity, arts, and culture to neighborhood revitalization in Memphis. The outcome was a concept focused on music – the most recognizable representation of Memphis’ creative heritage, and a strong element of the city’s current culture – and geographically targeted to the Soulsville USA neighborhood. Soul Music: An American music formed that emerged partly in Memphis, Tennessee, which incorporates elements of gospel, rhythm and blues. Soulsville USA: A neighborhood in Memphis, Tennessee that was once a cultural center with worldwide influence as the birthplace of American soul music, and home to Stax Records. The neighborhood was later impacted by decades of socio-economic and policy changes, but is currently at the center of creative placemaking revitalization strategy. 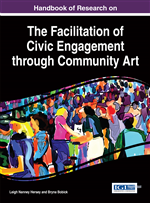 Creative Placemaking: Collaboration between public, private, nonprofit, and community entities that supports artists while using art to improve community vitality.